I ask this question to people for them to understand the importance of trust and the convenience of the agent, who looks out for your interest and everyday concerns. The Choi Agency believes in character, ability, strength and truth. 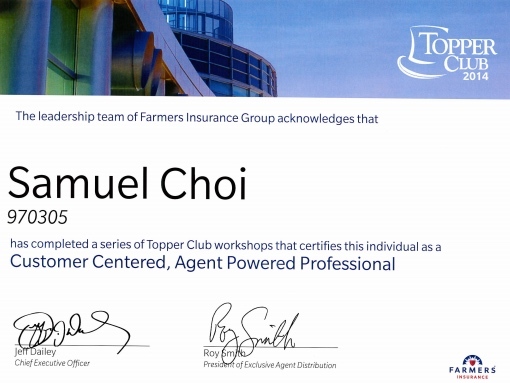 The Choi Agency does insurance business to take care of your everyday concerns (both personal and business). Bad news is that accidents and losses do occur. But the good news is that we have insurance companies you can leverage to get you back where you belong. Our family has been with Farmers for more than three decades. When it comes down to insurance, you want to make sure the insurance company has the ability to pay out claims and the track record of being true to the policy holders. Who is your insurance agent? Can you trust your insurance agent with your auto, home, business, or even your life? To contact me to see what it looks like to have your everyday concerns taken care of by the #1 insurance group of companies in CA.